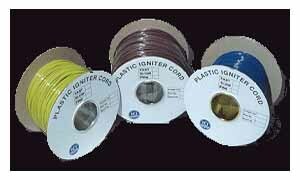 plastic igniter cord (PIC) is a type of fuse used to initiate an explosive device or charge. In appearance igniter cord is similar to safety fuse and when ignited, an intense flame spits perpendicular to the cord at a uniform rate as it burns along its length. 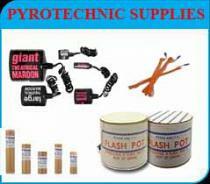 Igniter cord in construction is again similar to safety fuse, consisting of a pyrotechnic composition at the core, wrapped with a nylon sheath to provide shape and finally wrapped again in an outer plastic shell to provide water resistance. Normally, igniter cord also consists of a metal wire at the very center of the pyrotechnic core which also runs the entire length of the cord; the pyrotechnic composition will react with the metal wire (typically aluminum, iron or copper) to increase the energetics of the fuse.